The average cost of assisted living in Bedford is $2,447 per month. This is lower than the national median of $3,346. To help you with your search, browse the 11 reviews below for assisted living facilities in Bedford. On average, consumers rate assisted living in Bedford 4.1 out of 5 stars. Better rated regions include Chesterfield with an average rating of 4.4 out of 5 stars. To some people, Bedford is best known as the home of the National D-Day Memorial. The city was chosen for the memorial because it lost the highest number of residents per capita in the 1944 Normandy landings. Bedford, which then had a population of 3,200, lost 19 soldiers on D-Day and three more during the rest of the Normandy campaign. While these statistics are sobering, senior citizens may wish to visit the memorial while participating in other Bedford-area activities, such as scenic bus rides on the Blue Ridge Parkway. The area provides assisted living services to seniors as well, with two facilities in Bedford and 12 more in nearby Lynchburg and Troutville. The Virginia Department of Social Services licenses these facilities, which serve at least four residents each. Seniors in Bedford will observe seasonal weather changes. On a yearly basis, the city averages 215 sunny days, 13 inches of snow and 45 inches of rain. The low temperature in January is 27 degrees Fahrenheit, and the high in July is about 86. Bedford’s cost of living is 12 percent below the national average and 19 percent below the state average, so it's one of the more affordable communities in Virginia. Bedford's housing is particularly inexpensive, at 55 percent below the state average. The violent crime rate of 14.7 out of 100 is well below the national average of 31.1. However, property crimes, such as burglary and car theft, rank higher than the national average, at 50.3 versus 38.1. For its size, Bedford has a high crime rate compared with similar communities. Bedford has an array of community resources for seniors, including Bedford County Senior Programs provided through the Parks and Recreation Department. Along with socialization, the programs offer bingo, choir, line dance classes, picnics, crafts, driver safety classes and various senior-friendly activities. Seniors might be frustrated by the lack of public transportation in the city. Bedford does have a walk score of 68, so it may be possible for some seniors to do a few errands on foot. Area attractions that can make for fun outings include the Bedford Museum & Genealogical Library, the Claytor Nature Study Center and a variety of wineries and farms. Assisted Living costs in Bedford start around $2,447 per month on average, while the nationwide average cost of assisted living is $4,000 per month, according to the latest figures from Genworth’s Cost of Care Survey. 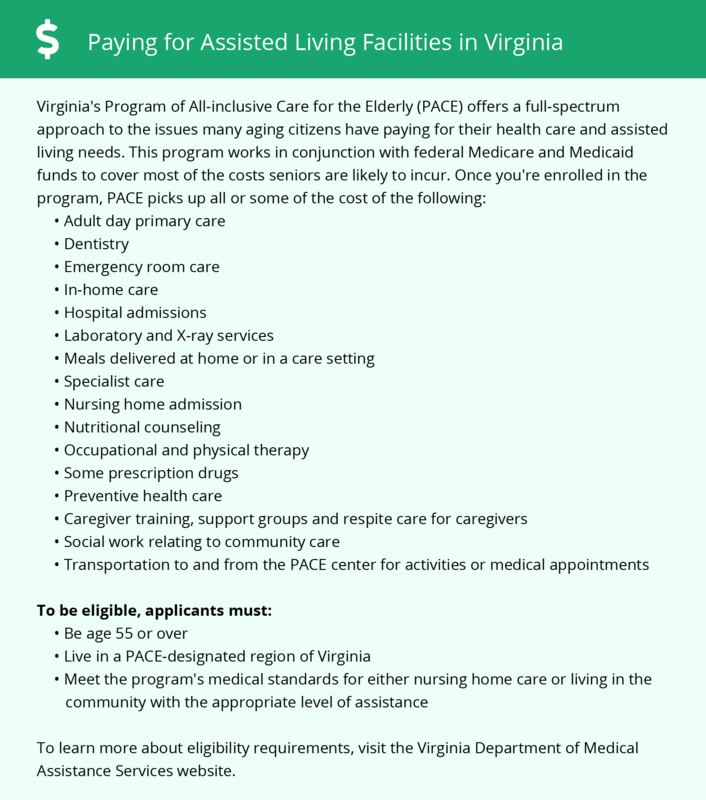 Virginia offers an auxiliary grant that can supplement some Bedford residents’ SSI income to help with assisted living expenses. Seniors with medical needs may also be eligible for funding through the CCC Plus Waiver. To see a list of free assisted living resources in Bedford, please visit our Assisted Living in Virginia page. Bedford-area assisted living communities must adhere to the comprehensive set of state laws and regulations that all assisted living communities in Virginia are required to follow. Visit our Assisted Living in Virginia page for more information about these laws.